They changed his looks, his life and his future... but they couldn't change his past. 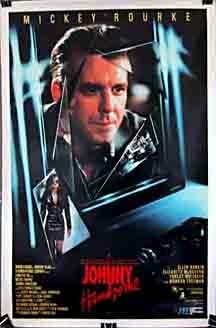 Johnny Handsome is a deformed gangster who plans a successful robbery with a friend of his, Mikey Chalmette, and another couple (Sunny Boid and Rafe Garrett). During the heist, Johnny and Mikey are double-crossed by Sunny and Rafe---Mikey is killed and Johnny sent to prison. While in prison, Johnny is invited to a rehabilitation program, where Dr. Steven Fischer rebuilds Johnny's face and helps Johnny get paroled. Johnny starts working in a shipyard, where he meets Donna McCarty and starts a romance. Lt. A.Z. Drones is a skeptical detective who follows the rehabilitation of Johnny. Johnny's new life is consumed by the desire of payback. Ethics, action and drama wisely directed. Time well spent.